Solutions for multi-dwelling reception in simple terms. IRS ( Integrated Reception System ) are now the most commonly installed systems within multi-dwelling property developments where planning stipulates a limited number of aerials and dishes can be ins talled on the property. The IRS system is aimed at being a full digital reception system allowing residents to watch analogue and digital terrestrial television (Freeview), Satellite channels commonly Sky digital and the new service ‘FREESAT’ but other satellites can be received for the benefit of multi-lingual residents. It will also allow residents to receive FM and DAB (Digital Audio Band) radio. CCTV cameras can also be added so residents have the ability to view areas outside the building such as car parks or entrances directly on a channel on their TV. 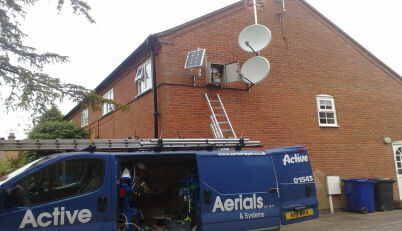 The system utilizes one TV Aerial, FM omnidirectional and DAB aerial (on one rig) and a satellite dish to service any number of points, Sky+ ,Sky HD and FREESAT are standard on our install. 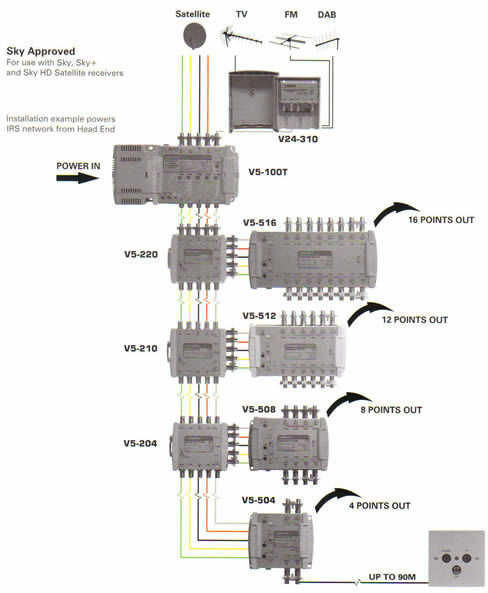 A Multiswitch is installed to receive, process and combine the signals and then distributes the signals through screened coaxial cables via a network to outlet plates in each dwelling, which then separates the signals allowing connection of TV, Satellite and Radio. Right from the initial conception to final completion Active Aerials & Systems will support you. Information on the system will be provided for each subscriber connected. On a new build information will be provided for insertion into the welcome packs issued by sales. DO YOU NEED A SYSTEM, BUT HAVE NO LANDLORD ELECTRICITY SUPPLY? We can help!! We have been installing Solar powered and Phantom powered systems for a number of clients who have no access to landlord supply. Solar powered IRS is a comparatively new concept made possible now due to several recent developments, most notably the decreasing cost of solar panels, the increased availability of so-called high efficiency encapsulated designs and purpose designed ultra low draw transistor stages now useable in antenna amplifiers (courtesy of the mobile phone industry). Solar powered IRS is one way of providing dwellings that as no landlord supply. 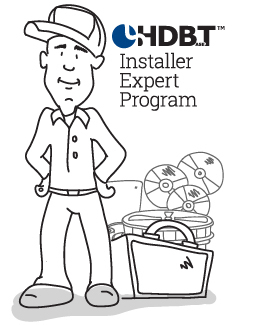 Once installed the solar powered IRS will need occasional maintenance set across a time frame agreeable between the installer and the client. The ‘Phantom’ Multiswitch as been specifically designed for installations that have no access to landlords supply. An alternative solution to the ‘Solar System’. 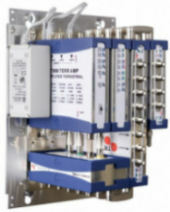 It operates in the same manner as traditional switches. This allows up to 16 dwellings to have signals for their Sky or Freesat satellite set top boxes (8 dwellings if twin tuner STBs are used) as well as terrestrial TV and radio receivers. The Phantom does not require a landlord's power supply. Each consumer powers their part of the system from their satellite set top box (or if they are a TV only household, from a small power supply). Even if only one consumer is connected to the system and all others are off, it will still operate very successfully. The Stacker De-Stacker solves the problem of upgrading your Sky/Sky Plus/Sky HD system cabling. It allows you to have 2 LNB feeds sent over a single co-ax cable. This means that you can upgrade from Sky to Sky HD or Sky Plus without running an extra co-ax cable from the dish through you house damaging your decor. It also means that you can upgrade from a single Sky Plus box to Sky Mulitroom with 2 Sky boxes runing over 2 runs of co-ax cable. Most of our calls for this component are for the communal systems that need to provide tenants with the dual feed needed for SKY+HD. In the early days of IRS installations to communal dwellings only one coaxial was provided for SKY. 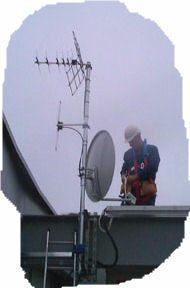 With the introduction of SKY+ that requires two feeds from the satellite dish a solution was needed. Upgrading the system head-end to provide extra points was relatively easy. The coaxial from the head-end to the consumer was still a single run, a way of transferring two satellite signals on a single coaxial was solved by the ‘Stacker & De-Stacker unit. In simple terms this is a device that with two parts. 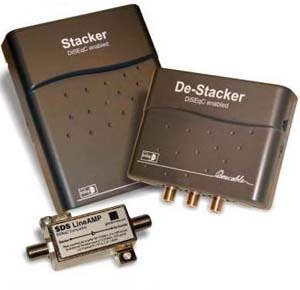 The ‘Stacker that is installed at the dish or the head end with two inputs from the Dish or the multiswitch then combines two satellite signals on a single coaxial that is fed to the ‘De-Stacker’ unit which then separates the signal into two signals that can be connected to a SKY+HD receiver.